The mayor and police chief of San Francisco unveiled on Thursday a program to improve pedestrian safety on the streets of the city by the bay, and the campaign could not come soon enough for those, including San Francisco pedestrian accident attorney Gregory J. Brod, who have been alarmed by the significant number of pedestrian fatalities and injuries there. According to local CBS station KPIX 5, Mayor Ed Lee has pledged that the city would spend $17 million into redesigning intersections and streets, with the anticipation that the modification would lead to greater pedestrian safety. There have been four pedestrian deaths this year, 21 in all of 2013, and 120 over the last seven years in San Francisco. During that same seven-year period, there have been more than 5,600 collisions involving a pedestrian, most of them with a motor vehicle. The gravity of the situation was not lost on Police Chief Greg Suhr, who said that the San Francisco Police Department would be cracking down on traffic violators, both drivers and pedestrians, by issuing citations at the five most dangerous intersections in each police district. And the police chief made an observation that drove home the seriousness of the problem. A measure of how dangerous some intersections can be has been on grim display this year at Sunset Boulevard and Yorba Street, where on Feb. 3 a man crossing the street was killed after being struck by a car and where, just two weeks later, a teenager was seriously injured while crossing at the same intersection after being hit by an automobile. Most recently, a pedestrian was hit and seriously injured Thursday when a taxi struck him while he was attempting to cross Van Ness Avenue, another notoriously dangerous stretch of road in San Francisco. 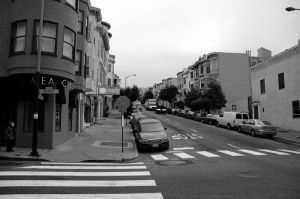 According to the San Francisco Chronicle, the city’s WalkFirst program has compiled statistics and analyzed more than 2,000 crashes over a five-year period in the city. The program found that during that timeframe, there have been more than 100 fatal or severe injury accidents each year, with another 800 injury-producing collisions, each year in San Francisco. The study determined that just 6 percent of the city’s streets accounted for 60 percent of the severe and fatal injuries. In an ominous prediction, an official with the Municipal Transportation Agency’s Livable Streets program said that the week after daylight-saving time should be more perilous for pedestrians because drivers tend to be a bit sleepy and due to the darker conditions. While statistically speaking, motorists are to found to be at fault in a majority of all collisions with pedestrians, regardless of that determination it is important for any pedestrian who has been injured after being hit by a motor vehicle to secure legal representation as soon as it is feasible to do so. An experienced personal injury lawyer will be the most effective advocate for seeing to it that the injured party receives the compensation they deserve. If you or a loved one has been injured or worse in a collision with a motor vehicle, please contact the attorneys at the Brod Law Firm for a free consultation.